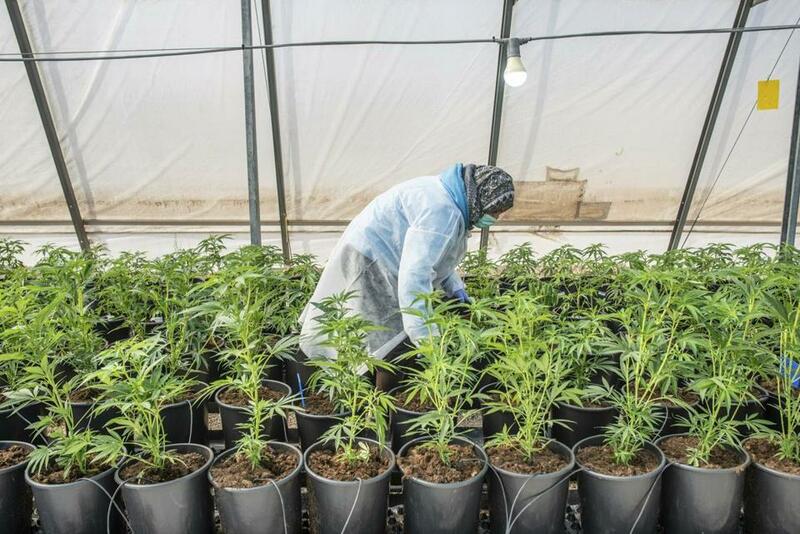 Cannabis seedlings are cared for by a worker in a greenhouse of the cannabis cultivating and processing plant of BOL Pharma – Revadim Industrial Center in Lod, Israel. The number of states with legal marijuana is expected to jump significantly in 2019, and many already-filed bills offer a look at what those new legal cannabis systems might look like. While marijuana legalization legislation has already been introduced in at least 17 states, including several traditionally conservative ones, there are 10 that seem to hold the most promise of passage at this point. 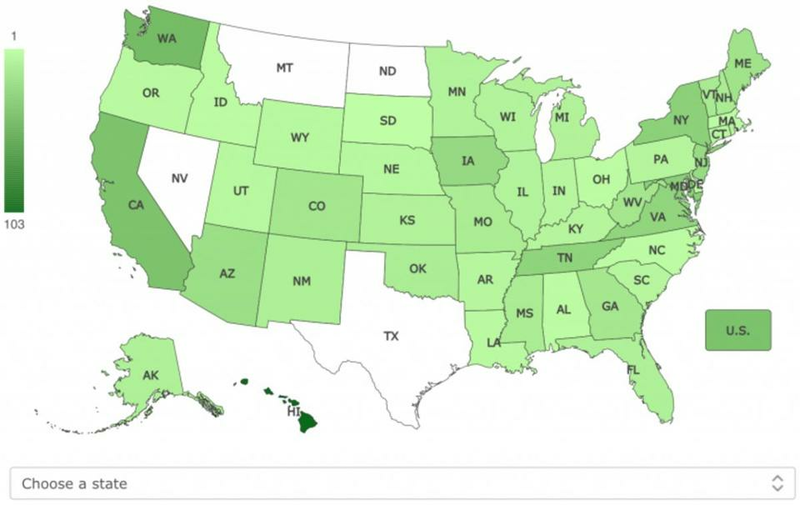 This heat map shows concentrations of relevant bills in each state and Congress. In Connecticut, several House and Senate proposals seek to fully legalize cannabis for adults 21 and older and also establish a commercial market. The Senate version was introduced on Thursday by Martin Looney, the chamber’s president, who also sponsored a legalization bill last year. More than a quarter of the House jointly filed a bill to legalize earlier this month. A third legalization proposal puts a focus on social justice by establishing a “cannabis equity policy through open legalization of cannabis” and includes provisions such as diversity requirements and justice reinvestment. Hawaii Senate President Ron Kouchi said that debating marijuana legalization will be a top priority for the state legislature this year. Seven legalization bills have been filed so far, and the chances of passing something in the Democratic-majority chambers are solid. The Senate Judiciary Committee is set to hold a hearing on one of the proposals on Thursday. That said, past attempts to approve cannabis reform bills in Hawaii have consistently stalled or failed, and Governor David Ige remains concerned about conflicting state and federal laws. What’s clear, though, is that Governor J.B. Pritzker is ready and eager to sign some kind of legalization legislation, a policy he campaigned on. Fifteen House members in Minnesota jointly filed a legalization bill last week. The legislation would amend the state constitution to allow for the possession, consumption, manufacturing, and sale of cannabis and cannabis products for adults 21 and older. New Hampshire lawmakers are moving forward with plans to fully legalize marijuana in the Granite State despite the fact that Governor Chris Sununu has threatened to veto such legislation. House Speaker Steve Shurtleff believes that, with Democrats now in control of both chambers, they have the votes to override a veto. So far, two bills have been introduced to legalize and establish a retail sales system. In New Jersey, eight bills have been filed to legalize marijuana, including ones that would involve expungements for past cannabis-related convictions. Legalization legislation was approved in committees late last year, but was never brought to a floor vote in either chamber. Advocates are hopeful that a bill will be taken up soon, but some concerns remain as to whether Governor Phil Murphy, who campaigned on legalization, will sign legislation that doesn’t include a high tax rate for cannabis sales. On Thursday, a bill to legalize marijuana and establish a commercial sales system was filed in New Mexico, sponsored by state Representatives Moe Maestas and Javier Martinez. There are four pieces of legalization legislation on the table in New York, where Governor Andrew Cuomo has pledged to enact a commercial cannabis system after previously calling marijuana a “gateway drug.” The Assembly version of the Marihuana Regulation and Taxation Act has 28 sponsors, while the companion bill in the Senate has 12. Rhode Island Governor Gina Raimondo was initially reluctant to embrace marijuana legalization but, in light of legalization efforts underway in neighboring states, she’s recently proposed ending cannabis prohibition herself. Her proposal, included in a budget request, would allow adults 21 and older to possess and purchase marijuana from a licensed retailer. However, under the governor’s plan, cannabis could be sold commercially by licensed retailers but not grown at home for personal use. She also wants to ban high-THC products including concentrates. Half of the Senate in Vermont, including the chamber’s president, has already signed onto a bill that would allow for commercial marijuana sales. The state legalized the personal use, possession, consumption, and cultivation of cannabis last year, but there’s currently no option for people to legally buy marijuana. That said, Governor Phil Scott has said that he’d be reluctant to sign a commercial legalization bill until technology was developed to detect active impairment from cannabis on the roads. In Delaware, legalization came close to passing last year but didn’t get the required supermajority support. In Wisconsin, Governor Tony Evers recently said he supports legalization.